Appa Scotland Ltd is a company incorporated in Scotland with company number SC512087 and having its registered office at The Alhambra Suite, 4th Floor, 82 Mitchell Street, Glasgow, G1 3NA (“Appa“, “we“, “us“, “our“). Our website is www.appawellbeing.com (the “Site“) and our mobile Platform is called APPA (the “Platform“). Set out below are the terms and conditions (the “Terms“) you are agreeing to when you use (however you access it including from a mobile device) the Site and/or the Platform. These Terms cover (i) the download of the Platform through the Site or from any App Store and (ii) use of the Site. You should read, and ensure that you understand, all of the Terms prior to using the Site and/or the Platform. If you do not agree to be bound by these Terms then you should not use the Site and/or download or use the Platform. The “Platform” shall mean the software provided by Appa to offer services allowing analysis of users’ emotional wellbeing and any upgrades from time to time and any other software or documentation which enables the use of the APP. By using the Platform you agree to be bound by these Terms. Please review them carefully before installation on your device and/or acceptance. You are being given access to the Platform as an authorised user of the establishment (such as a school) which has taken a licence of the Platform from us (the “Licensee“). You will be given a user name and password by the Licensee who administers such matters, but it is your responsibility to keep your user name and password secure. By using the Platform, you warrant that you have the right, authority and capacity to enter into and be bound by these Terms and that you are the person authorised to use the relevant user name and password. By submitting information to the Platform, you agree that, whilst we may contact you in relation to the information you have provided, we are not obliged to provide you with any particular service. We make no warranty that the contents of the Site and/or the Platform are free from infection by viruses or anything else which has contaminating or destructive properties and shall have no liability in respect thereof. We do not represent or guarantee the truthfulness, accuracy or reliability of any material contained on the Site or obtained by using the Platform. All such material is intended as information only and does not constitute advice. You acknowledge and agree that any reliance on material contained on the Site and/or obtained via the Platform is at your own risk. We have taken every care in the preparation of the content of the Site and the Platform, however we cannot guarantee uninterrupted and totally reliable access to the Site or other services provided through the Platform, and therefore cannot guarantee that the information will always be completely up to date and free of mistakes. To the extent permitted by applicable law, we disclaim all warranties, express or implied, as to the accuracy of the information contained in any of the materials on the Site and/or obtained via the Platform and will accept no liability for any loss or damage arising as a result of problems with access. We shall not be liable to any person for any loss or damage howsoever caused which may arise from the use of any of the information and materials contained on the Site and/or obtained via the Platform. By using the Platform you will access information provided by the Licensee and those who have been authorised by them to provide content other than responses to questions. We are not responsible for any such data they upload or otherwise provide to you. If they provide hypertext links these may lead you to other websites which are not under our control. When you activate any of these you will leave the Site and we have no control over and will accept no responsibility or liability for the material on any website which is not under our control. We may make software owned or operated by third-party companies available to you. You must only use this software in accordance with the terms and conditions imposed by the third-party provider. We may suspend the Site and/or operation of the Platform or any part of it at any time and for any reason whatsoever, including but not limited to repairs or upgrades, and shall not be liable to you for any such suspension. We reserve the right to alter these Terms from time to time by posting new terms and conditions on the Site. Your continued use of the Site and/or the Platform (or any part thereof) following such change will be deemed to be your acceptance of such change. It is your responsibility to check regularly to determine if the Terms have been changed. If you do not agree to any change to the Terms, you must stop using the Site and the Platform with immediate effect. If any provision of these Terms is held by any competent authority to be illegal, invalid or unenforceable in whole or in part then such provision shall be deemed to be omitted and the validity of the other provisions of these Terms shall not be affected. All liability is excluded to the maximum extent permitted by law including any implied terms. The exclusions of liability set out in these Terms shall not apply to any damages arising from death or personal injury caused by our negligence, or any of our employees or agents. Nothing in these Terms shall, whether directly or indirectly, give or be deemed to give any enforceable benefit of any kind to any third party as against us. Any failure or delay by us to enforce any of these Terms shall not be considered a waiver by us of our right to enforce such term or condition of these Terms. The Platform allows you to access certain functionality available on the Site. If you are authorised by the Licensee to administer their use of the Platform you may be given the right to upload data, content or other materials and information. 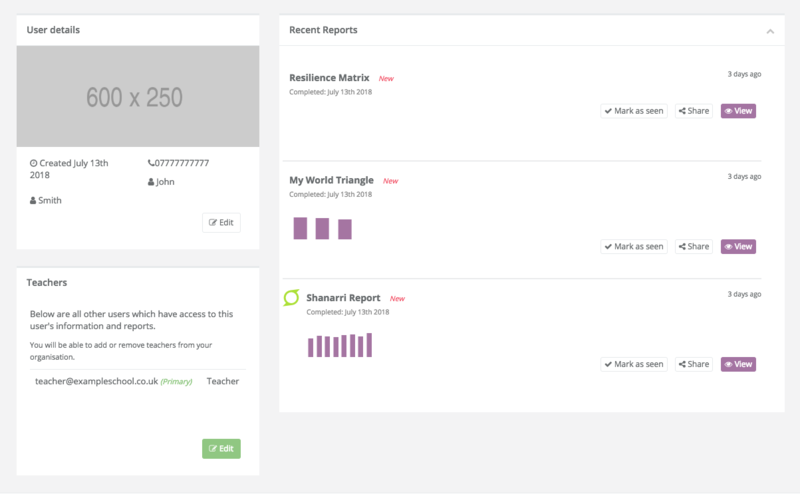 If you are using the Platform to allow assessment of your emotional wellbeing then you will be prompted to provide answers to questions. that you will not impersonate any other entity or use a false name that you are not authorised to use. THE PERSONAL INFORMATION WHICH YOU SET UP IN YOUR PROFILE UNDER THE PLATFORM IS NOT DISCLOSED BUT MAY BE ACCESSED BY THE LICENSEE TO VERIFY YOUR IDENTITY. ensure that you exit from your Platform account at the end of each session. We cannot and will not be liable for any claims, loss or damage of any nature whatsoever, including indirect, consequential or economic losses of profit arising from your failure to comply with these requirements. making use of the Site, the Platform and/or the materials in a way which infringes the intellectual property rights of any other party. In the event that we consider that you are making any illegal and/or unauthorised use of the Site and/or the Platform and/or your use of the Site and/or the Platform is in breach of these Terms, we reserve the right to take any action that we deem fit, including terminating your use of the Platform without notice and with immediate effect and, in the case of illegality, instigating criminal proceedings. Notwithstanding any other provision of these Terms, we may, at any time and for any reason, terminate these Terms with you and deny you access to the Platform. attempt to copy, reproduce, alter, modify, reverse engineer, disassemble, decompile, transfer, exchange or translate the Platform. The copyright and all other intellectual property rights in the material contained on the Site and the Platform, together with the website design, images and source code, belongs to us and all rights are reserved. You warrant that you are the owner, or alternatively that you have obtained the necessary consent(s) from the owner(s), of all and any material that you post on the Platform. You grant to us a non-exclusive, perpetual, irrevocable, royalty-free licence to use any material that you post on the Site or via the use of the Platform for the purposes of providing reports on your responses to the Licensee in accordance with these Terms. allow any other person access to any password, user ID or account information held by you in connection with the Site or the Platform. view and print the content of the Platform for your personal and non-commercial use only. We draw your particular attention to Section 4.2 above. You acknowledge and agree by your use of the Platform that your responses and method of doing so may be analysed to provide reports to the Licensee regarding your overall responses to questions asked through your use of the Platform, but we confirm specific answers will not be released to the Licensee. In no event will Appa be liable for any direct, indirect, special, punitive, exemplary or consequential losses or damages of whatsoever kind arising out of your use or access to the Platform, including loss of profit or the like whether or not in the contemplation of the parties, whether based on breach of contract, tort (including negligence), product liability or otherwise. Appa is not liable to you for any damage or alteration to your equipment including but not limited to computer equipment, handheld device or mobile telephones as a result of the installation or use of the Platform. Nothing in these Terms shall exclude or limit Appa’s liability for death or personal injury caused by negligence or for fraud or fraudulent misrepresentation or any other liability which cannot be excluded or limited under applicable law. These Terms shall be governed by and construed in accordance with English law. If any provision of these Terms shall be unlawful, void or for any reason unenforceable, then that provision shall be deemed severable and shall not affect the validity and enforceability of the remaining provisions. By accepting these Terms you submit to the non-exclusive jurisdiction of the Scottish courts. The Customer’s attention is particularly drawn to the provisions of clause 10. “Term” has the meaning set out in clause 11.1.
a reference to writing or written includes e-mail but not fax. The Order constitutes an offer by the Customer to purchase access to the Portal during the Term in accordance with these Conditions. The Order shall only be deemed to be accepted when the Supplier issues written acceptance of the Order (which may be constituted by the Supplier issuing an invoice) at which point and on which date the Contract shall come into existence (“Commencement Date”). Any descriptive matter or advertising material issued by the Supplier (on its website or otherwise) is issued or published for the sole purpose of giving an approximate idea of the Portal. They shall not form part of the Contract or have any contractual force. The Supplier grants the Customer a non-exclusive, non-transferable licence to permit Authorised Users to access the Portal via a Secure Network for the Customer’s internal purposes during the Term only. The Customer may create profiles for Authorised Users in the Portal and permit Authorised Users to create profiles for themselves or (in the case of Leaders) Candidates who are other Authorised Users in the Portal in accordance with the licence granted in this clause 3. Where a maximum number of Authorised Users (Leaders and/or Candidates) has been specified in the Order the Customer shall ensure that the number of Authorised Users it permits to access the Portal does not exceed such number(s). downtime attributable to failure of the Supplier’s suppliers or subcontractors. The Customer can contact the Supplier through the online enquiry form on https://appawellbeing.com/contact, the email address info@appawellbeing.com and the telephone number 0141-847-0774, and can submit support requests relating to the Portal during the hours of 09:00 to 17:00 on Business Days only. The Supplier shall respond to such requests within a reasonable timeframe and will use reasonable endeavours to resolve any reported issues. The Customer acknowledges that from time to time during the Term, the Supplier may apply upgrades to the Portal and that such upgrades may result in changes to the appearance and/or functionality of the Portal. The Supplier may make changes to the content of the Portal (including the addition and/or removal of content) from time to time. It is acknowledged and agreed that the Supplier has the right to contact the Customer and the Authorised Users through the Portal’s messaging systems and by email or phone as provided by the Customer and the Authorised Users to inform the Customer and the Authorised Users about information relating to the Portal and related services. The Supplier will not pass any Customer and Authorised Users’ contact details to third parties. obtain and maintain all necessary licences, permissions and consents which may be required in relation to the Contract and to use of the Portal by Authorised Users. and the Customer shall immediately remove from the Portal any material submitted by an Authorised User which is inappropriate or otherwise breaches the terms of the User Terms. If the Customer becomes aware (or should have become aware) that the Portal has been used by an Authorised User inappropriately or otherwise in breach of the User Terms the Customer shall immediately notify the Supplier and delete the profile of such Authorised User and ensure that they do not in the future access the Portal unless otherwise agreed by the Supplier. The Supplier shall be entitled to invoice the Customer on the Commencement Date. The Supplier shall not be required to grant the Customer access to the Portal in accordance with clause 1 until payment of the Charges have been received in full. All amounts payable by the Customer under the Contract are exclusive of amounts in respect of value added tax chargeable for the time being (“VAT”). Where any taxable supply for VAT purposes is made under the Contract by the Supplier to the Customer, the Customer shall, on receipt of a valid VAT invoice from the Supplier, pay to the Supplier such additional amounts in respect of VAT. If the Supplier does not receive payment of the Charges or of the Customer breaches any term of the Contract the Supplier may temporarily disable the Customer (and its Authorised Users’) passwords, account and access to all or part of the Portal and the Supplier shall be under no obligation to provide access to the Portal while the payments concerned remain unpaid. If such amounts remain unpaid for one (1) month or more the Supplier may delete the Customer’s account (which for the avoidance of doubt shall include deletion of Authorised Users’ profiles) and upon deletion the Contract shall terminate. Without limiting its other rights and remedies, if the Customer fails to make any payment due to the Supplier under the Contract by the due date for payment, then the Customer shall pay interest on the overdue amount at the rate of 6% per cent per annum above the Bank of England’s base rate from time to time. Such interest shall accrue on a daily basis from the due date until actual payment of the overdue amount, whether before or after judgment. The Customer shall pay the interest together with the overdue amount. All Intellectual Property Rights in the Portal (excluding the content in the Portal uploaded by or on behalf of the Customer and/or an Authorised User) are and shall remain the property of the Supplier or its third party licensors. All Intellectual Property Rights in and to any content uploaded to the Portal by or on behalf of the Customer and/or an Authorised User and any reports generated from such content shall belong to the Customer and/or its Authorised Users and the Supplier has no rights thereto other than to the extent required to perform the Contract. The Customer acknowledges that, in respect of any third party Intellectual Property Rights, the Customer’s use of any such Intellectual Property Rights is conditional on the Supplier obtaining a written licence from the relevant licensor on such terms as will entitle the Supplier to license such rights to the Customer. All Supplier Materials are the exclusive property of the Supplier and, at the Supplier’s request, shall be returned to the Supplier or destroyed at the end of the Term. put in place appropriate technical and organisational processes and procedures to safeguard against any unauthorised and unlawful Processing of, and against accidental loss or destruction of, or damage to, the Portal Personal Data. The Customer acknowledges that the Supplier may review and access the Portal Personal Data from time to time for the purposes of preparing reports regarding responses of Authorised Users and use some or all of the Portal Personal Data for purposes solely of performing its obligation under the Contract. The Customer shall keep in strict confidence all technical or commercial know-how, specifications, inventions, processes or initiatives which are of a confidential nature and have been disclosed to the Customer by the Supplier, its employees, agents or subcontractors, and any other confidential information concerning the Supplier’s business, its products and services which the Customer may obtain. The Customer shall only disclose such confidential information to those of its employees, agents and subcontractors who need to know it for the purpose of discharging the Customer’s obligations under the Contract, and shall ensure that such employees, agents and subcontractors comply with the obligations set out in this clause as though they were a party to the Contract. The Supplier may also disclose such of the disclosing party’s confidential information as is required to be disclosed by law, any governmental or regulatory authority or by a court of competent jurisdiction. This clause 9 shall survive termination of the Contract. the Supplier’s total liability to the Customer in respect of all other losses arising under or in connection with the Contract, whether in contract, delict (including negligence), breach of statutory duty, or otherwise, shall in no circumstances exceed the average annual amount of the Charges payable by the Customer. The Supplier does not guarantee that any content made available through the Portal is accurate, complete or error free. The Customer undertakes not to rely upon any content made available in the Portal. Any reliance the Customer places upon the Portal or the content made available in the Portal is entirely at the Customer’s own risk and the Customer undertakes not to hold the Supplier liable for any loss, cost, damage or expense incurred as a result of such reliance. The Supplier does not guarantee that the Portal will be free of errors or defects or operate in an uninterrupted manner. The Supplier does not guarantee that the Portal will not interfere with the performance or operation of the computer or device through which it is accessed or other software installed thereon or peripherals connected thereto (and any software installed on said peripherals). The Supplier does not guarantee that the Portal will be free of viruses or other malicious code. The Supplier does not guarantee that the Portal is suitable for any particular purpose or that it will meet the Customer’s requirements, irrespective of whether that purpose or those requirements are known to the Supplier. Other than as expressly stated hereunder the Supplier excludes all guarantees, warranties, conditions and representations whether express or implied. This Contract shall, unless otherwise terminated as provided for in the Contract, commence on the Commencement Date and continue for the period set out in the Order (the “Initial Term”) and thereafter shall automatically renew for successive periods of one (1) year (each a “Renewal Period”) (the Initial Term and the Renewal Period together being the “Term”) unless and until terminated by either party giving to the other at least three (3) full calendar months’ written notice to expire at the end of the Initial Term or any subsequent Renewal Period. Without limiting its other rights or remedies, the Supplier may terminate the Contract by giving the Customer thirty (30) days’ written notice at any time following which the Supplier shall repay to the Customer on a pro rata basis any Charges paid in advance by the Customer relating to the period after the date of termination. if the other party ceases to do business or becomes insolvent or an order is made or a resolution passed for the winding up of it or an order is made for the appointment of an administrator to manage its affairs business or property, or a receiver is appointed of its assets or undertakings or circumstances arise which entitle the court or a creditor to appoint a receiver or manager or which entitle the court to make a winding up order, or it suffers any similar or analogous action in consequence of debt. Without limiting its other rights or remedies (including without limitation those in Clause 6.4), the Supplier may terminate the Contract with immediate effect by giving written notice to the Customer if the Customer fails to pay any amount due under this Contract on the due date for payment and fails to pay all outstanding amounts within 30 days after being notified in writing to do so. clauses which expressly or by implication survive termination shall continue in full force and effect. If the Force Majeure Event prevents the Supplier from performing any of its obligations for more than four (4) weeks, the Supplier shall, without limiting its other rights or remedies, have the right to terminate this Contract immediately by giving written notice to the Customer. The Customer shall not, without the prior written consent of the Supplier, assign, transfer, mortgage, charge, subcontract, or deal in any other manner with any or all of its rights or obligations under the Contract. Any notice or other communication given to a party under or in connection with the Contract shall be in writing, addressed to that party at its registered office (if it is a company) or its principal place of business (in any other case) or such other address as that party may have specified to the other party in writing in accordance with this clause, and shall be delivered personally, sent by pre-paid registered first class post or other recorded next Business Day delivery service, commercial courier, or e-mail. A notice or other communication shall be deemed to have been received: if delivered personally, when left at the address referred to in clause 2.1; if sent by recorded pre-paid first class post or other recorded next Business Day delivery service, at 9.00 am on the second Business Day after posting; if delivered by commercial courier, on the date and at the time that the courier’s delivery receipt is signed; or, if sent by e-mail, one Business Day after transmission provided that the sender does not receive a notification that delivery has been unsuccessful. Governing law. This Contract, and any dispute or claim arising out of or in connection with it or its subject matter or formation (including non-contractual disputes or claims), shall be governed by, and construed in accordance with English law. Jurisdiction. Each party irrevocably agrees that the courts of Scotland shall have non exclusive jurisdiction to settle any dispute or claim arising out of or in connection with this Contract or its subject matter or formation (including non-contractual disputes or claims). Would you like to know more? If you have any questions about any of our products, fill out the form below and we'll get back to you as soon as we can. Or request a quote for your school or organisation.